You might not say that. It might be far more colourful! A baby wouldn’t say that. More than likely it would be a heart-wrenching cry as those responsible for the outburst make the usual soothing noises. The nurse says it will be just a little prick! Is it? Sometimes maybe, but the sting and soreness will linger. A vaccination is not just a little prick. It is not something you can brush aside with a smile or a pat on the back. immunization schedules have to be “sold”. There is a message to promote. Vaccinations and good health are synonymous: “Believe us. You can trust us. Vaccines are safe and the schedules will be adjusted to accommodate further protection from more and more illnesses.” How many more little pricks will that be? The majority of parents seem to have been persuaded — often against their better judgement. Do the “Persuaders” always tell the truth? Are all the “facts” made known? Do the “little pricks” equate to subtle deceptions, lying by omission, and creating an ever increasing captive market based on fear, and profit-driven motives? Is informed choice possible when the dice are so heavily loaded? How are people treated who choose not to vaccinate? Can the public good be served by allowing irresponsible lifestyles coupled with the false assumption that dubious substances injected into the body will be a guaranteed cure all? What about the long term side effects? Before you or your children agree to becoming needle cushions for what lies ahead, consider carefully the contents of this book. Published by the Robert Reisinger Memorial Trust. This 496 page book brings out into the open many of the finding of well-documented research, as well as the sobering experiences of many parents and their children, which need to be considered carefully, before anyone accepts without question the assurances of medical establishments and the powerful profit-driven messages from vested interests. The Robert Reisinger Memorial Trust would like to make this book readily available to anyone who would like to own a copy. The book will be sent to you airmail which will take between 3-7 working days. The Trust has further projects to undertake in the future which will rely on the support of those who request this book. This book is offered as a community service, not as merchandise for sale. The Trust wishes to make it available to all who would like it, no matter their resources. However, if..... you would like to make a donation to enable the work of the Trust to continue to be ongoing, a donation would be greatly appreciated. New Zealand. Phone : (0064) 92368990. For people living outside New Zealand, where different currencies are involved, cash donations (bank notes) would be quite acceptable, with conversion being done in New Zealand. The bank has advised that overseas personal cheques can be accepted. If you would like a receipt for any donation you chose to send, please indicate, and one will be sent, either e-mail, or mail, or with the book. Normal accounting procedures will be strictly followed, and all acknowledgements and receipt notifications filed. As of March, the postage rates in NZ dollars (without track and trace) were: USA/Canada 27.07, Europe 29.90, UK 25.41, Australia 12.90. To find the $ NZ postage rates for your country, go to this website, select your location and put in 1 kg as weight. That will show you how much it will cost us in postage. The amount of postage required will show in the results column. Please address all mail to the address given above. 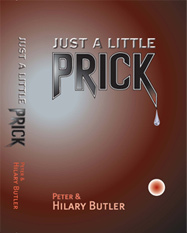 Peter and Hilary Butler. Dr Robert Reisinger was a medical researcher and veterinarian. For about 15 years Hilary often went to him as a resource person, mentor and tutor, and they worked together on a number of occasions helping parents understand the importance of gut flora, breast-feeding and the effect of vaccines on babies. On his death in 2003, Dr Reisinger made provision in his will for the purposes of funding future research and writing, into sudden infant death syndrome, vaccines and various aspects of endotoxemia and shaken baby syndrome, recognizing that Hilary had been closely associated with him in these areas of his expertise, and that she would be the only one able to promote and continue the research. One example of their collaboration is attached separately to this letter. At the beginning of 2004, the RRMT was established for the charitable purposes of such medical research giving the trustees complete and exclusive authority to determine the medical fields and research which are related to vaccines, sudden infant death syndrome, shaken baby syndrome and endotoxemia, particularly as they relate to the health of mothers and children. In particular Dr Reisinger wanted the focus to be a grass roots education with an emphasis on helping parents better understand important issues and enabling them to be in a more knowledgeable position to make informed choices about how they chose to parent their children.